DJ Joc Max is one of the founders of Soulful Sundays, a monthly, family-friendly party in the Volker neighborhood. A block away from 39th street in the Volker neighborhood, music pours out of the MO Brew pub. Windows are wide open on a warm May day, and families are spilling out onto the sidewalk: babies, teens and toddlers mixing it up with the grown-ups. Necia Gamby was brought into Kansas City's hip-hop community by her children; now she's considered a matriarch. With her long silver dreadlocks, Gamby knows a thing or two about raising up a scene. Her kids are grown now – she just had a grandchild – but when they were young, her house was the place where her children’s friends learned the basics of DJing and audio engineering. And to keep all those little hands busy when they’re not dancing, one of Kansas City’s pre-eminent street artists has provided coloring pages. May marked the one-year anniversary of the monthly event Soulful Sundays. According to DJ Ataxic and DJ Joc Max (who split the afternoon at the turntables), it didn’t start out as a family affair. The two veteran Kansas City DJs say they just wanted an opportunity to bring together friends and followers who too often see each other only on social media. But then people started asking if they could bring their kids. And the bar owners were fine with it; after all, they serve food too. 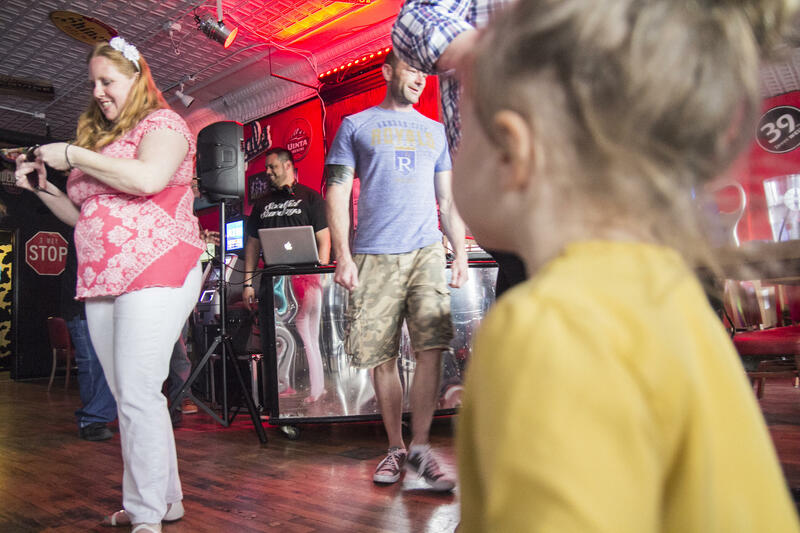 The monthly party at MO Brew is really all ages: from babies to elders. Ataxic, Joc Max and Scribe all have kids now, ranging in age from 9 to 17, so they led the way. “I can easily say this is my favorite gig that I’ve ever had – ever,” says Ataxic, otherwise known as Brian Fisk. He says it’s a dream to be able to squeeze it in between church and dinner. The artist Scribe – Donald Ross – says this monthly event is a way for him to introduce his sons to the music that inspired him as a young man. “That was a heartbeat behind everything I did during my building-block years,” Ross says. 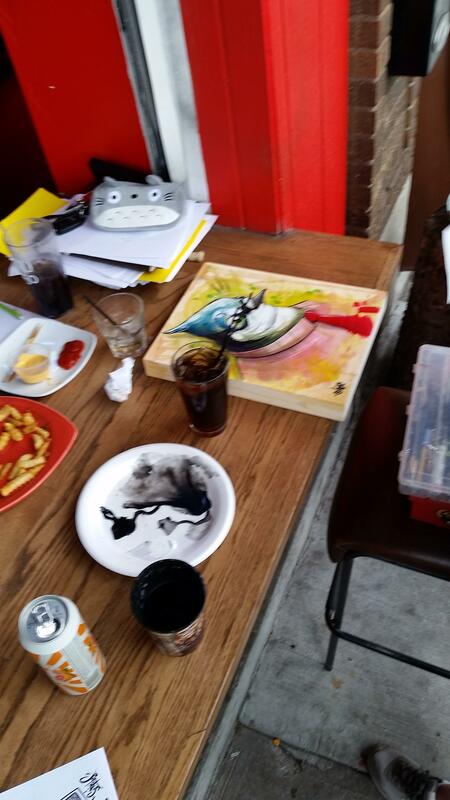 Street artist Scribe creates a painting while hanging out at Soulful Sundays. His work is all over midtown and downtown Kansas City: spray-painted murals of fantastical animals. Ross had his days as a renegade graffiti artist, but is now artist-in-resident at Children’s Mercy Hospital. How grown up is that? He knows as much as anyone how hard it is to pass your music on to your children in a didactic way. But at an event, they can form a memory around it. “At least I can share it with them on more of an experience level,” Ross says. DJ Joc Max – Thomas McIntosh – can relate. He's the one whose daughter is now 17. Even his mom is here. She’s the one who inspired him to be a DJ in the first place. And now, another generation will have these memories to pass on, or reject, as the case may be. Hear more about the Scribe, DJ Joc Max and Necia Gamby on a recent brodcast of KCUR's Central Standard. Sylvia Maria Gross is a reporter and editor at KCUR, and senior producer of the show Central Standard. You can reach her at sylvia@kcur.org and follow her on Twitter@pubradiosly.